Perfect for students! Full size portfolio with 3" gusset. 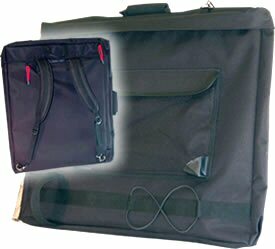 External mesh pocket for supplies, plus storage for t-square and mailing tube. Can be carried via traditional handle, shoulder slung, or carried back pack style using convenient, built in shoulder straps. Rugged metal hardware provides exceptional durability. We can order this portfolio for you. If it is in stock with our supplier it would arrive on Tuesdays and Thursdays around 11:00 am. The correct item number will come later.